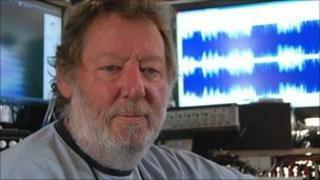 Music producer Martin Rushent, who worked with bands including the Human League and the Stranglers, has died aged 63. His son, James, confirmed on his Facebook and Twitter pages that his father had died on Saturday. Rushent started as an engineer in the 1970s, working on records by T-Rex and Fleetwood Mac among others. He produced the Human League's hit album Dare, which contained the classic "Don't You Want Me?". Rushent also worked with the Stranglers, Buzzcocks, XTC, Generation X, the Go-Go's and Altered Images. A tribute page has been set up on Facebook called Martin Rushent Memories. His son, James, guitarist for the band Does It Offend You, Yeah?, who he also produced, paid tribute on the page. "I will miss him, so so much, he was my best mate," he said. The Stranglers paid tribute to him on their official website, saying: "We have just received the sad news that another early band collaborator, Martin Rushent, passed away yesterday aged 63." Rushent produced the band's first three albums, Rattus Norvegicus, No More Heroes and Black and White. Rushent, from Reading, Berkshire, leaves behind wife Ceri, sons James and Tim and daughters Amy and Joanne.